These little capsules expand rapidly when they come into contact with liquid, creating a life-sized animals made entirely of sponge! The animals grow using however much liquid is initially available, so if you have only a gallon on hand, expect a very tiny T-Rex. The maximum amount of liquid a sponge can retain is 500 gallons, which is about two and a half hot tubs or 12 bathtubs or 32 kegs. The Sponges of Growth move and act similar to their animal counterparts, but are not sentient. For every five gallons of liquid they hold, they have one hit point (with a minimum of one). The sponges hold liquid for eight hours or until they are reduced to zero hit points. 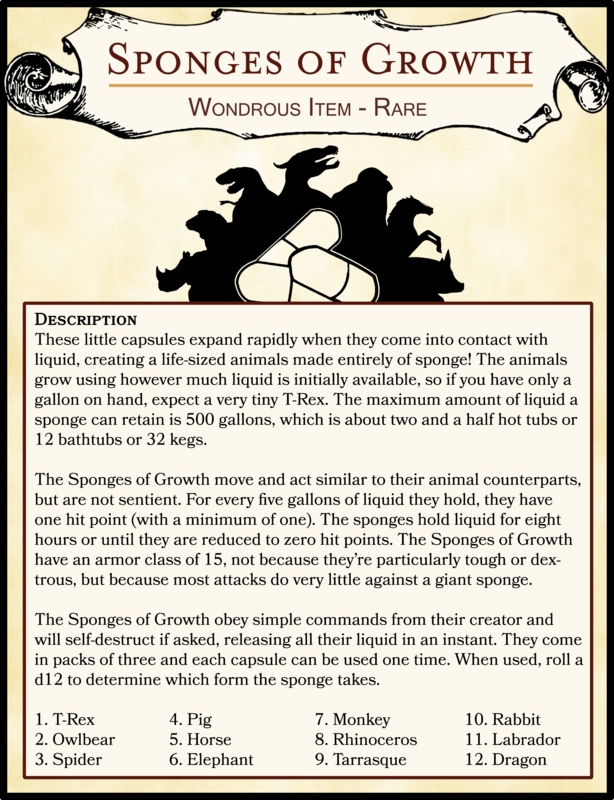 The Sponges of Growth have an armor class of 15, not because they’re particularly tough or dextrous, but because most attacks do very little against a giant sponge. The Sponges of Growth obey simple commands from their creator and will self-destruct if asked, releasing all their liquid in an instant. They come in packs of three and each capsule can be used one time. When used, roll a d12 to determine which form the sponge takes.